Cookie Butter Oreos have arrived for fall 2017 and are the latest limited edition cookies from the Nabisco brand. 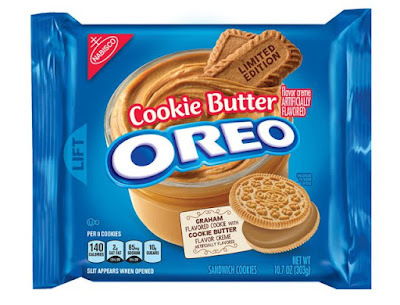 The new packaged dessert feature a filling of speculoos cookie butter-flavored creme sandwiched by graham-flavored wafers. You can find them on store shelves nationwide in 10.7-oz packages with a price of about $3 (may vary). Pumpkin Spice Oreos (review) are also back this fall.